Slad which lies about 2 miles north of Stroud is a village in the Slad Valley amid the rolling hills of the Cotswolds in Gloucestershire. Slad Brook runs along the valley bottom through some wonderful wildflower meadows which have little changed over the years. The small village consists of a few houses, a school, the Holy Trinity Church and a pub the Woolpack. The village is famous for being the home and final resting place of Laurie Lee, who based his book “Cider with Rosie” on his own life in the village. Laurie Lee, author and poet was born in Stroud in June 1914 and moved to Slad with his family in 1917. At 12 years old he went to school in Stroud. He left school at 15 to become an errand boy for Chartered Accountants in Stroud. At 20 he became an office clerk and a builder’s labourer and lived in London for a year before leaving for Spain in the summer of 1935. He started to study for an art degree but returned to Spain in 1937 as an International Brigade volunteer but his service was cut short by his epilepsy. Before 1951 he worked primarily as a journalist and as a scriptwriter. During World War II he made documentary films. From 1944 to 1946 he worked as the Publications Editor for the Ministry of Information. Laurie was married in 1950 and became caption writer in chief for the Festival of Britain for a year for which service he was made a Member of the Order of the British Empire in 1952. Laurie Lee’s successful autobiographical novel “Cider with Rosie” in 1959 allowed him to become a full time independent writer. The novel is an account of his childhood in the village of Slad in the period soon after the First World War. In 1960 Laurie Lee returned to Slad, the much loved village of his childhood, with his wife after buying a cottage with the proceeds of the novel. He wrote two more follow up novels “As I Walked Out One Midsummer Morning” in 1969 and “A Moment of War” in 1991. He remained in Slad until he died in May 1997 at the age of 82 and is buried in the Holy Trinity Churchyard. “Cider with Rosie” continues to be one of the UK’s most popular books and is often used as a set English literature text for school children. Laurie Lee’s first love was always poetry but was only moderately successful as a poet. His first poem appeared in the Sunday Referee in 1934. 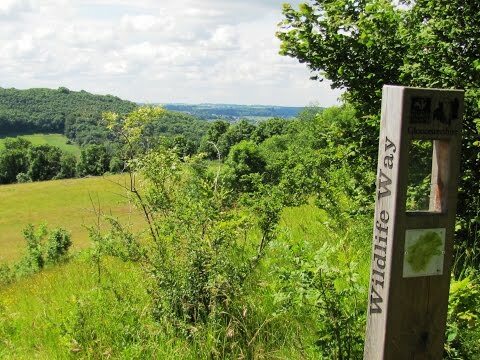 The Laurie Lee Wildlife Way wanders through one of England’s most beautiful valleys linking four Gloucestershire Wildlife Trust nature reserves and the Woolpack pub where Laurie Lee often visited. The Slad Valley, immortalised in the works of famous local author Laurie Lee, is dotted with ten posts inscribed with his poetry. There is an eleventh post at the Museum in the Park in Stroud. The posts celebrate the connection between Laurie Lee and the landscape of the Slad Valley that inspired him throughout his childhood. This is a lovely family walk that follows the Laurie Lee Wildlife Way waymarked with red arrows and don’t forget to look for the Laurie Lee poems inscribed on posts. From the lay-by we walk uphill with Slad behind us for a short way and turn right at the public footpath sign into the wood. We head forwards on the track downhill to a gate. We go through the gate and follow the red arrows down the track bearing right. When the track splits we bear right at the red arrow on the tree. We follow the path downhill to cross over Slad Brook with a pond on our left and then uphill going over the next track. We then start climbing steeply to the top. At the top we head straight forward crossing the track to go over the stile in the wall. We now come out into the open and bear diagonally left downhill through the wild flower meadows to a gate in the corner. We go through the gate into Snows Farm Nature Reserve and bear left downhill through woodland. The path bears right down to a stile. We cross the stile into the open and turn right following the valley on narrow paths through the fields and wild flowers meadows. We eventually descend to a small gate at the far end of the reserve where we go through and cross a stream near the hut and information centre go through another gate and turn right. We go through a kissing gate and head downhill for a short way to meet a stream we turn left through the gate. As we go through the gate there are two paths we take the right one with the stream on our right. We head forward for a short way then cross over the stream via the plank with a red arrow on it. We go up the slope and over a stile then bear left uphill towards Catswood. We cross over the stile into the wood and turn immediate right following the track along the edge of the wood. We go through a metal gate and stay on the track as it bears left ignoring any paths going off left or right. Just after a hollow way which joins in from the right we bear left at the fork in the track. We soon arrive at a tarmac lane we turn right downhill. We pass the entrance to Furners Farm and go round a sharp left-hand bend to the hamlet of Elcombe. Just past the hamlet and the last cottage we turn left up the wooden steps into Laurie Lee Wood nature reserve and turn right following the steep path through the woods until we reach a gate. We go through the gate entering Swift’s Hill nature reserve and turn left through the gate with a red arrow uphill passing the disused quarry on the right. At the top we come out into the open we bear right and follow the faint path down the front of the hill to go through a gate onto a lane. We head forwards past Knapp Farm then at the bend we turn right onto a track (byway) signposted Upper Vatch Mill. After a short way we cross the waymarked stile on the right and turn left through the field. We cross another stile and head forwards following the arrow. We cross over two more stiles by a pond then bear right through the field to cross a stile onto a track. We turn left uphill between the trees and then bear left at the tarmac track. We head forwards past a bungalow then turn right between the buildings and head straight on through a wooden gate. We cross over a stile and keep heading forwards through the field to go through the gate. We cross over the stream by a pond and follow the path to a lane with a building on the left. We turn left onto a tarmac lane going uphill then at the top we bear left slightly downhill. At the main road we turn left and head forwards to The Woolpack pub at Slad where Laurie Lee used to visit. We then cross the road to the Holy Trinity Church to visit Laurie Lee’s grave in the churchyard. We return back along the road until we come to the War Memorial. We turn left uphill on the track leading to Frith Wood nature reserve. At the sign post next to a building we turn right and follow the lower woodland edge for a short way before going uphill on the bridleway, marked by blue spots on the trees. We keep to the bridleway until we come to another bridleway and a seat with a red arrow on the leg. We turn right and keep heading forwards following the bridleway along the ridge and then descend to lay-by at Bulls Cross. This is a moderate walk on gravel and grass tracks and paths, some parts can be muddy. There are a few inclines and declines and one very steep incline. Elevation: Approx lowest point 93.70m (307.4ft) approx highest point 213.80m (701.44ft) approx ascent 344.60m (1130.58ft). Approx 5.75 miles allow 3 hours using OS Explorer Map 179, Gloucester, Cheltenham and Stroud. This walk is done anti-clockwise. Start point: Bulls Cross lay-by on the B4070 north of Slad village. Free parking. Slad Valley is in the Cotswolds, Gloucestershire. From M5 take junction 11A onto the A417 towards Cirencester. Then take the B4070 through Birdlip for approx 5 miles. Bulls Cross lay-by is on the left. Parking: Lay-by at Bulls Cross north of Slad village. Free parking. There are no public toilets the nearest ones are in Stroud. For refreshments there is The Woolpack at Slad on the B4070 and plenty of shops, cafe, pubs and restaurants in Stroud.